On Thursday, 27th September, Dr Eleanor McLaughlin, Lecturer in Christian Ethics at Regent’s Park, will be discussing the ideas and life of Dietrich Bonhoeffer on BBC Radio 4’s ‘In Our Time’. Hosted by Melvyn Bragg, this episode of the BBC radio show will focus on the German theologian, born in Breslau/Wroclaw in 1906 and killed in the Flossenbürg concentration camp on 9th April 1945. Bonhoeffer developed ideas about the role of the Church in the secular world, in particular Germany after the Nazis took power in 1933 and demanded the Churches’ support. He strongly opposed anti-Semitism and, with a role in the Military Intelligence Department, took part in the resistance, plotting to kill Hitler and meeting with contacts in the Allies. 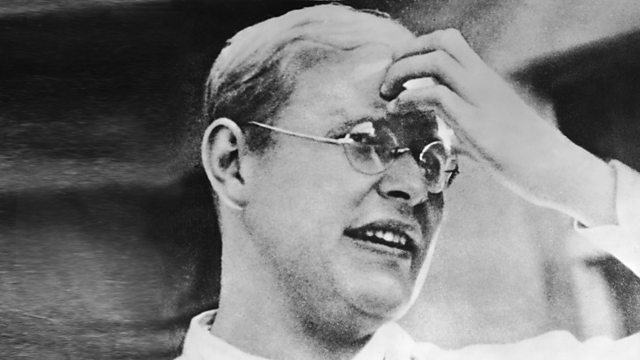 Bonhoeffer’s ideas on Christian ethics and the relationship between Christianity and humanism spread more widely from the 1960s with the discovery of unpublished works, including those written in prison as he awaited execution. Dr McLaughlin will be speaking alongside Stephen Plant, Dean and Runcie Fellow at Trinity Hall at the University of Cambridge, and Tom Greggs, Marischal Chair of Divinity at the University of Aberdeen. You can listen to the broadcast online using BBC iPlayer Radio, or can listen live on BBC Radio 4 at 9am on 27th September.